North America ain't what it used to be, chummer - every time you cross a border, you enter a different world. Ask an anglophone in Quebec, an ork in San Fran, or a mage if the NAN. The rules are different, both in the shadows and in the sunlight, and if you don't keep up with the local game, you're gonna lose. 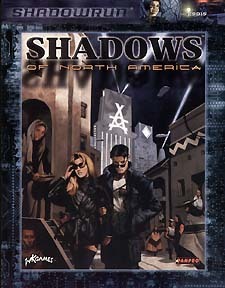 Shadows of North America tells shadowrunner what they need to know about the 13 countries and city-states of North America, including the Native American Nations and the dragon-ruled city of Denver. Each state is covered in detail, from hot spots to power players, all from a shadowrunner's point of view. For use with Shadowun, Third Edition.